Welcome to Edmonton and the library! We have many free services, resources and materials at EPL to help you transition to and enjoy life in our city. Get a FREE library card - Sign up online to get started, or visit any of our 20 branches with your identification and proof of address. Attend FREE programs - We have programs for the whole family: storytimes, help to create a resume and programs to help you learn English. Use a computer for FREE - All of our branches have computers with Internet and email access, word processing, printing and faxing. All you need is a free library card. All of our branches also have free WiFi. Borrow our materials - With your free library card, you can borrow books, movies and music. We have materials available in 20 languages from around the world, including Arabic. 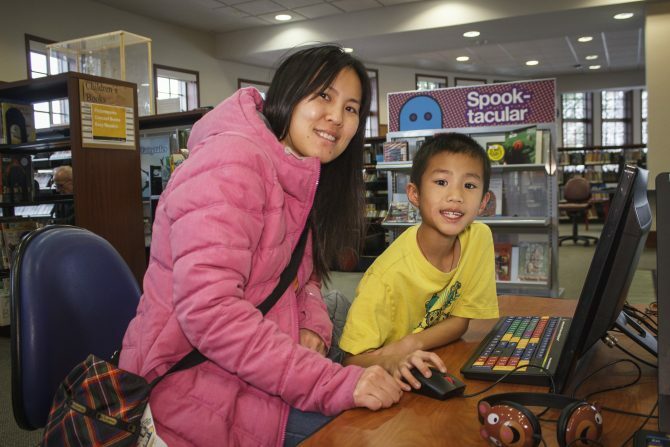 Access electronic items - With your free library card, you can access eBooks, audiobooks, download or stream music, movies, and same day newspapers from around the world! We also have and more than 100 databases, such as Mango Language Learning. Study for the Canadian citizenship test - With your free library card, you can access Canadian Citizenship Practice Exams from the Learning Express Library. The library has staff who can help you find the answers common questions about settling in Edmonton. We have Community Librarians at every branch and Settlement Practioners at specific locations. Find out more. Valuable information and resources to assist with job searches and education choices. Includes information for foreign workers and English test preparation tools. A list of agencies and organizations in the Edmonton area that can help newcomers. An introductory guide to help new residents settle in Edmonton. These guides list the recreation, community, and school programs offered by the City of Edmonton. The Refugee Alberta website is a provincial hub of information for refugees, immigrant-serving organizations and the community at large. Resources include information for organizations on how to build their capacity to serve newcomers, as well as information for newcomers on volunteering, donations and sponsorship. Immigration, Refugees and Citizenship Canada (IRCC) has developed a very useful database to assist newcomers find services and agencies to help them settle in Canada. Use this tool to find free services close to where you live. Are you a new Canadian Citizen? Apply today onlineopens a new window for a FREE Cultural Access Pass that gives you access to more than 1,000 attractions across Canada. You can pick up your pass at any library location too! Does the Library have free internet access?